I would like to announce a newly published book exploring why the cradle of our discipline was to be found in ethnographic research in the Russian Arctic. The present book sums up the results of decades of research into early ethnographic scholarship during the exploration of Siberia in the 18th century and its links to the German enlightenment. Han F. Vermeulen explores primary and secondary sources from Russia, Germany, Austria, the United States, the Netherlands, Hungary, the Czech Republic, Slovakia, France, and Great Britain in tracing how “ethnography” was begun as field research by German-speaking historians and naturalists in Siberia (Russia) during the 1730s and 1740s, was generalized as “ethnology” by scholars in Göttingen (Germany) and Vienna (Austria) during the 1770s and 1780s, and was subsequently adopted by researchers in other countries. Han F. Vermeulen is a research associate at the Max Planck Institute for Social Anthropology in Halle (Saale) and the Max Planck Institute for the History of Science in Berlin. 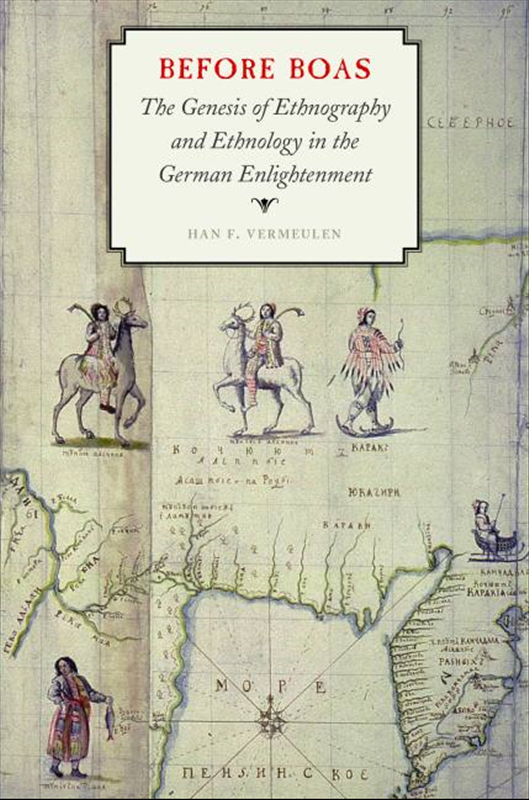 Before Boas: The Genesis of Ethnography and Ethnology in the German Enlightenment. Lincoln and London, NE: University of Nebraska Press, 2015. Hardback, xxvi + 720 pp. ISBN 978-0-8032-5542-5. 10 images, 6 maps, 12 tables. Price: $75.00, £52.00, € 53,95. If you want to purchase the book directly from the publisher feel free to mention the discount (25%) code when ordering in the US with customerservice@longleafservices.org use code 6AS15. This entry was posted in Announcements, Indigenous Peoples, Publications, Russian North, Theoretical Issues and tagged Anthropology of the North, Arctic History, Arctic research, ethnography, Siberia. Bookmark the permalink.